Put the cream cheese, sour cream, and dulce de leche, in the bowl of a food processor. (This will require a large bowl. If necessary, divide and work in batches.) Blend until well incorporated, stopping to scrape the sides and the bottom. Scrape the vanilla beans and add the seeds to the bowl with the sugar and the salt. Blend again until smooth. Then, with the food processor running slowly add the evaporated milk, followed by the eggs, one at a time. Strain the mixture into a large spouted measuring cup and divide between twenty-four 5-ounce baking tins or ramekins. Bake in a water bath(s), filling with water to come about halfway up the tins, until the flans are set, about 30 minutes. Carefully remove the pan(s) from the oven. If necessary, remove some of the water from the water bath before moving. Let cool in the water for about 5 minutes. Then, carefully transfer the tins to cooling racks and cool completely. Refrigerate until cold. Serve with fresh fruit, a cookie, or a combination of the two. 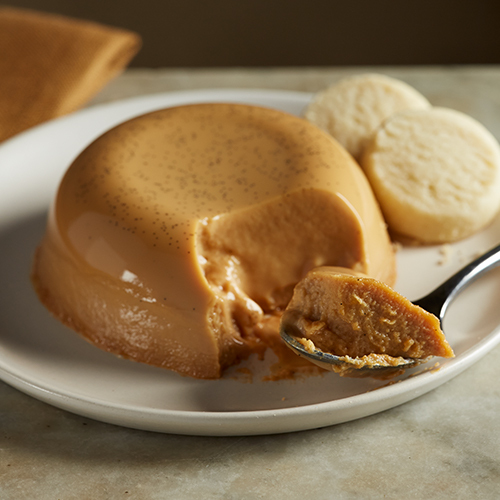 Note on making dulce de leche: Remove the labels from two 14-ounce cans of sweetened condensed milk. Place on their sides in a large saucepan and cover completely with water. Bring just to the point of boiling. Cook, adding water as needed to keep the cans covered, and rotate them occasionally, for 4 hours. Carefully remove from the water and cool.